How I Get the Easiest Curls Ever. While Sleeping. I know I’ve mentioned before that I hate doing my hair. I want to have it both ways. I want to do nothing, and still have the cutest hair ever. It turns out it doesn’t really work that way, but I still try. 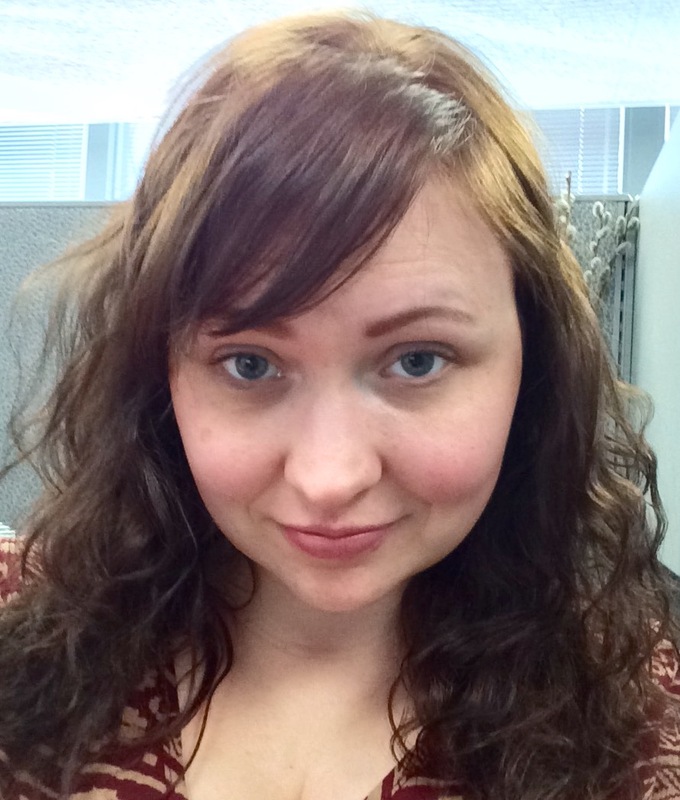 This is my story of how I accidentally figured out how to get curls in my super straight, thin hair by doing almost nothing. Step 1: shower, comb out wet hair with a wide tooth comb. I have bangs, so I pulled those out to be blow dried. Step 2: spray hair with some sort of texturizing spray (I use Sea Spray by Lush) and part down the middle. Step 3: put in buns. I use a small ponytail holder (my hair is super thin, I’m not kidding) and pull my ponytail through halfway, then halfway again (pictures 2 & 3). Just make two sloppy buns. 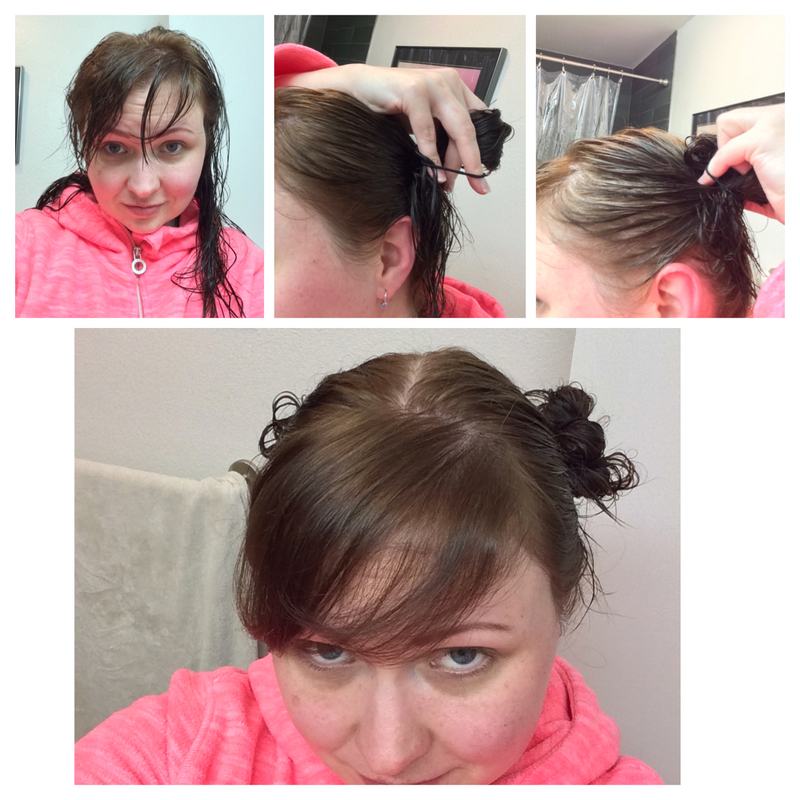 Step 4: dry bangs if you have them. Go to sleep. If you have thick hair, you might need to either let your hair dry a little before putting it up, or dry it when you take it out of the buns in the morning. When I get up, I just take the hairbands out and fluff out the curls. 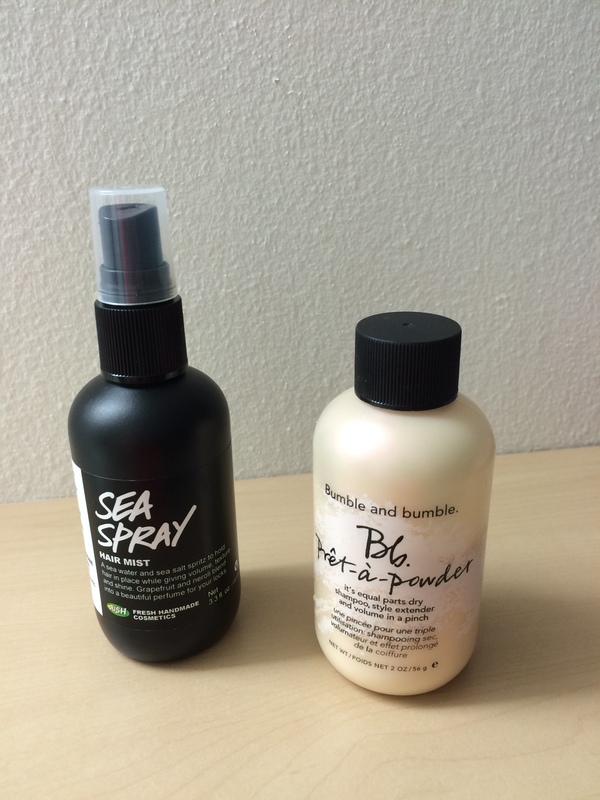 I add the Bumble and Bumble pret-a-powder for volume in my bangs and top of my head, then scrunch the curls with more Sea Spray. Done! I’m not trying to claim this is the cutest hair in the world, but after a life of flat hair, I like having texture. I also like that I don’t have to dry my hair before bed. Let me know if you try this, or have other easy hair tips for me. Try it 🙂 I love it. I like to do this sometimes rather then curling my hair. Also, putting your hair in braids after a shower gives pretty waves. I never could get the braid option to work right because the ends of the braids were still straight and looked weird. How do you fix that? Thank you so much 🙂 I figured this out by accident, due to my laziness. Go figure… It actually worked for me for once! My search for texture for my hair continues, but this is a great start! It’s also a lot easier to not wash it every day when it is wavy. Hmm. I’m going to try this. As thick as my hair is though may need to do more than 2 buns! Umm yeah I think you would need more like four 🙂 But it’s so cute, you should try it!